Please feel free to visit come of these links to find out more information. Freemason University is an online resource created to share essential tools for the leaders of our craft. The Allied Masonic Degrees are an invitational organization, and requires membership in the Royal Arch as well as the Symbolic Lodge. Membership is limited to 27 members per council. The Red Cross of Constantine is officially The Masonic and Military Order of the Red Cross of Constantine and the Orders of the Holy Sepulchre and St. John the Evangelist, the latter two of which are called the Appendant Orders. 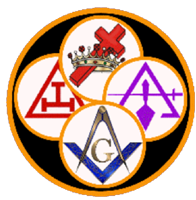 An Invitational Masonic Organization for 32nd Degree Masons or Knights Templar with at least five years in the Fraternity and distinguished service in Masonic, Church, or Civic Activities.